From time to time, as we are making a bespoke gate, (by bespoke I mean a gate made to our customer’s own design, rather than a made to measure gate from our own range of gates), we like to show you exactly goes into one of them so you can get an idea how we make them and the quality to expect in everything we produce. So once again, we’re going to have a look at a bespoke wooden gates with raised panels; if you don’t know what raised panels are, then all will be revealed! Normally, we would have asked for more information (we did have the sizes elsewhere in case you’re wondering), but we have made several things for this particular customer (hello if you’re reading this!) in the past and he trusted our judgement on bringing his gate design to life. 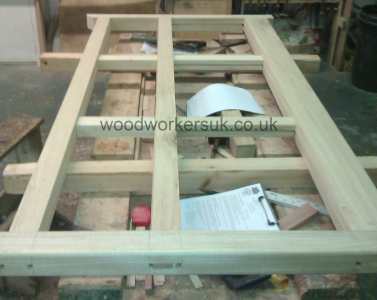 The main framework of the gates, together ‘dry’ prior to the panels being fitted. 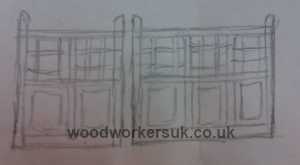 The sketch isn’t really that clear; gates themselves are split approximately into one third/two thirds to give a pedestrian access gate and a larger gate which is only opened to get a car in and out. The bottom section of the gates features the raised and fielded panels, with the top section of the gates comprising a lattice effect, again in timber. As with any gates, the first part of the process is to get the main frame of the gates together (above). 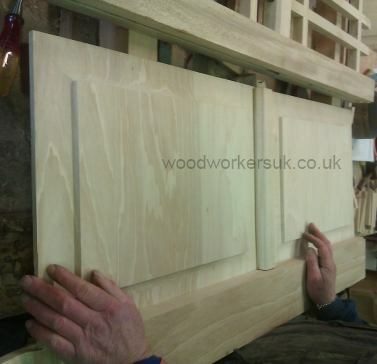 As with everything we make, the main framework of the gates is based on a through-wedged morticed and tenon jointed frame (don’t settle for stub tenons – they are not up to the job!). Once the main framework of the gates is together ‘dry’ (without any glue), we then start to work out all the sizes required for the lattice work in the top section of the gates and the raised panels in the bottom of the gates. The lattice work is all jointed together prior to the gate going together. Where the timbers overlap in the lattice work, these are jointed together, glued and cramped. 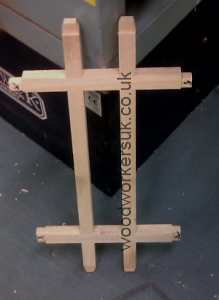 Where the lattice work meets the main frame of the gates, these are again jointed into the framework using a stub tenon (this is where a stub tenon SHOULD be used – for intermediate members within a structural framework and not for the structural framework itself). We’ve got the gates together dry (with no glue holding it together), we’ve worked out the sizes for the lattice infill in the top section of the gates, so now we can move on to the raised and fielded panels in the bottom section of the gates. If you’re not sure what raised and fielded panels are, then pictured below are the panels used in the gates. The centre of the panel is raised (hence the ‘raised’ in the name) and surrounding the raised section is a border section – this is the fielded part of the panels. This fielded section is not flat, it tapers in thickness; the widest section being at the intersection with the raised part of the panels and tapering down to the edges all around the panel. The panels themselves are again solid Idigbo (solid timber; no plywood is used in any of our gates or doors), glued and jointed to suit the width of each panel that is required. 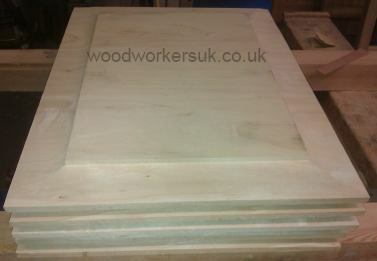 Once the panels have been made, the panels can then be inserted into the bespoke gates as they are glued up. The raised and fielded panels, awaiting fitting into the gates. Once fitted in the gates, the panels are left loose – they are not glued or nailed in position. By not fixing them down, they are allowed to move (the natural movement of timber!) – by allowing them to move freely you reduce the chances of the panels splitting. The original sketch of the required gates. The completed gates, hung and taking pride of place on our customers driveway! A word on raised panels…there are some limitations on what you can do with raised and fielded panels. For example, the narrower the panel the better, as the wider the panel is, the more likely it is to move, due to the natural movement of timber – go too wide and the panels are more prone to movement, which in turn can leave the panels more likely to split. For best results, the panels should be loose within the framework of the gates or doors – this enables them to move naturally and reduces the risk of splitting. If you like what we do then please also check out our Bespoke Victorian style gates. If you’ve got a bespoke wooden gate or garage door design and no one can help, maybe you should call the A Tea…erm maybe you could just give us a call and see what we can do for you!